Gluten-Free Living > Gluten Free > Celiac Disease > Are Bacteria to Blame? Groundbreaking research has been making headway, speaking to the possible influence of gut bacteria on celiac disease. In my own experience as a person with celiac disease, my health can be tipped completely off balance by ingesting gluten. But I’ve also noticed that when I eat gluten by accident, my mouth tastes different, my stomach bloats, digestion slows, and I feel sluggish and tired—all symptoms of bacterial overgrowth, according to the journal Gastroenterology and Hepatology. A June 2016 study published in Gastroenterology speaks directly to this possibility. Researchers at McMaster University discovered that bacteria can metabolize gluten. More specifically, scientists from the Family Digestive Health Research Institute discovered that mice with the bacterium Pseudomonas aeruginosa (Psa for short), which is found in the gut of those with celiac disease, metabolize gluten differently than those treated with lactobacillus. They found that lactobacillus detoxified gluten while Psa caused inflammation. Could this cause the symptoms that I and many other celiac patients have experienced firsthand? Previous research by Verdu, published in the American Journal of Pathology in 2015, directly correlated intestinal microbiota changes to increased celiac disease risk in mice. Although it’s too early to jump to conclusions, this exciting news will hopefully lead to breakthroughs in the world of celiac disease and gluten sensitivity. “The results may help us develop strategies to prevent these disorders, but more research is needed,” says Verdu. According to Verdu’s most recent paper, “When we analyzed the chemistry of gluten metabolism by Psa and lactobacillus, we found that Psa produced gluten sequences that stimulated inflammation in celiac patients, while lactobacillus were able to detoxify gluten.” However, says Verdu, the results have to be considered in the greater context of what is currently known of celiac disease pathogenesis. Gluten exposure causes celiac disease in those who are genetically predisposed, but bacteria in the gut could tip the balance between some people developing the disease and others staying healthy. Jennifer Finke, a certified holistic health and nutrition coach in Englewood, Colorado, has had personal experience with bacterial overgrowth due to gut bacteria. Diagnosed with celiac disease, Finke didn’t improve on a gluten-free diet alone. “I decided to turn my diet around. I realized that I had candida, or yeast and bacteria, built up in my gut. 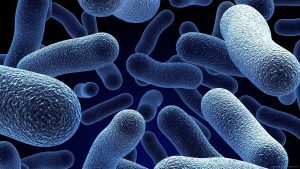 I repopulated my gut with beneficial bacteria via probiotics, limited my sugar intake [sugar feeds bad bacteria and yeast], and started eating clean, healthy foods like organic veggies and organic meats,” says Finke. After just a few days of taking probiotics and limiting sugar, she started to feel better than she had when merely quitting gluten alone. Although it’s difficult to scientifically corroborate these results as of today, anecdotal stories such as Finke’s abound. A diagnosis of small intestinal bacterial overgrowth (SIBO), a disorder of excessive bacterial growth in the small intestine, has been reached more frequently in recent years. Unlike the colon, which is rich with bacteria, the small bowel usually has fewer than 10,000 organisms per milliliter. Patients with bacterial overgrowth typically develop symptoms including nausea, bloating, vomiting, diarrhea, malnutrition, weight loss and malabsorption. Margaret Romero, a board-certified nurse practitioner with an integrative medical practice in New York, treats individuals with SIBO, which she has suffered from herself. She suspects that many individuals have bloating from unsuspected SIBO as well as undiagnosed celiac or gluten sensitivity. “Probiotics along with [herbal or prescription] treatment is necessary. Eradicating the bacteria and not feeding [them] gluten, among other things, is the key to optimal recovery,” says Romero. A 2016 study in Gut looked into the correlation between a weakened intestinal barrier in those with celiac disease and the ability of microbes to enter the body. Armin Alaedini, an assistant professor of medicine at Columbia University in New York City and the main researcher behind this study, had previously found strong evidence of a weakened intestinal barrier in those with gluten sensitivity, with results published in Gut in 2014.
effective new treatment strategies,” says Alaedini.